Technically, all you need in order to write is a pen and paper. Or a stick and some dirt. If you want to get macabre about it, a drop of blood from your finger and a crisp, white bed sheet. However, I find that typing works best for me. But if I type on my laptop, I inevitably get distracted. And so, when I found out that there was such a thing as word processors that had their own keyboards but no connection to the internet, I had to know more. Thanks to Chris Baty’s book, No Plot? No Problem!, I discovered the Neo2 by AlphaSmart. But I didn’t rush out to buy one. After all, who knew if I would even like it? I eventually mentioned that this technically outdated technology existed, and my friend responded with, “Oh you can borrow mine if you want.” Apparently these were in use for kids in East Coast classrooms over a decade ago. We Southern kids had skipped that stage in technology entirely and gone straight to computers. So, with a happy heart, I went into my fourth NaNoWriMo armed with a borrowed Neo (the predecessor to the Neo2.) And it was brilliant. The display is small with only four lines of text visible at once. If you’re anything like me, before you start writing you have a tendency to go back and read what you’ve already written. Well that’s mighty inconvenient with the Neo. You have to scroll up forever four lines at a time to find the beginning of the chapter. Eventually you might just decide to get on with writing instead of doing the endless scrolling using the arrow keys. And that’s the point! 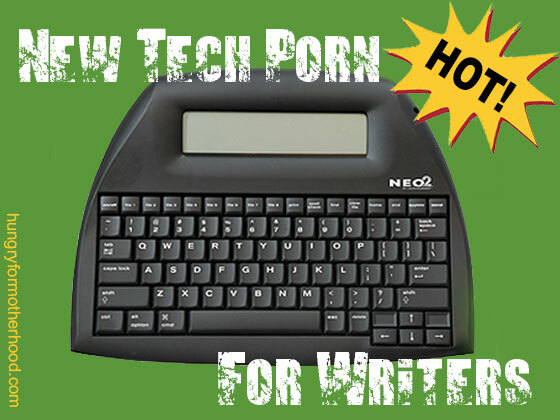 It has a word count feature, an important component of NaNoWriMo, and even a calculator. It’s the bare basics, and that’s why it’s extraordinary. Now this is the best part: the Neo DOES NOT PLUG INTO A WALL! You can take it to a coffee shop, pull it out of your bag, press the ‘ON’ button and just start typing. That’s it. It runs on THREE AA BATTERIES. And it has a battery life of 700 hours! I can’t describe it as anything other than brilliant. Maybe phenomenal. Exceptional might work too I suppose. But brilliant is what keeps coming to mind so I’m sticking with it. Now, if you’re at all familiar with Google Docs, this next part will feel like a welcome friend. If you type for 20 minutes, then get up to refill your coffee, your Neo might go into ‘sleep’ mode to save battery life. “Oh no!” you think, “I’ve lost everything!” But not to worry! Your text is autosaved all the time. There is no need to remember to save. If you come back with your fresh cup of coffee and find it’s turned off, merely hit the ‘ON’ button again and there’s everything you wrote right up to the moment you had to relieve your bladder. BRILLIANT! So at this point, you’re asking yourself- well, what about when I want to print? Or email it to myself? Or do anything with it that doesn’t involve composing. How do I get it off a device that doesn’t have wi-fi? My friend, allow me to introduce you to, The Cord. Yet again, in perfect simplicity, the cord is your key to transferring your much agonized-over words to a proper computer. You simply plug it into the Neo’s port, then plug the USB side into your computer. Now there is one little drawback with the Neo on this point. When the Neo transfers your writing to a word processor on your comp (like Microsoft Word or Google Docs) it doesn’t do it in a saved file like you would on your computer normally. Instead you must place the cursor in your document where you want the words to appear. And then, press ‘Send’ on the Neo. While you get yet another cup of coffee (you really should consider cutting down) the Neo will send the text, letter by letter, to the computer. You could sit there sipping on your dark roast and watch the words magically fill the page on the computer screen because, depending on how much you’re transferring over, it could take five minutes or more. Relax Benedict. No one’s going to take your coffee away. Honestly, I find those five minutes to feel very rewarding. It’s like getting a chance to watch everything you’ve done happen again at high speed. You can feel good knowing that you’ve written another 10 pages as you watch your words fly by and the page number creep up. For me, it’s not much of an inconvenience. It might be a breaking point point for someone else. I wrote my very first 50,000 word novel on that borrowed Neo. So the next year, I wanted to have one of my own. But at $119 new (before shipping) from the Neo Direct website, for what is technically considered an outdated technology, I thought I’d try second-hand first. After all, I had great luck with my friend’s borrowed Neo. So I set out for the untamed wilds of ebay, half.com and craigslist. I eventually found a used Dana, which is two steps back from the Neo2. Mostly I bought it because it was blue. But it was not nearly as good as the Neo. The keys were louder and more sticky. Every letter was a battle as it took more effort to punch the key than I was used to. I did manage to write a book on it, but I ended up doing a lot more writing directly into Google Docs than on the Dana. It was clunky and uncomfortable. But the worst part was, it didn’t even have a word count option! When the used Dana stopped auto-saving my writing, I actually breathed a sigh of relief. It was time to do what I should have done initially. So earlier this year, I decided to bite the bullet and buy the Neo2 from the factory brand new. They threw in a nifty portfolio so I can look a little more impressive at the coffee shops. And it is…wait for it…brilliant! It does everything the Neo did and more. I can change the display to show only two lines of text all the way up to six. Still not enough to distract me into re-reading what I’ve already written, but allows me to take my glasses off while writing if I up the text size. The typing is smooth and easy like on a normal laptop. Transferring to a computer is the same, but like I said earlier, that’s not a drawback for me. And it’s still got that new tech smell. What happened to your British composure, man? So if you’re a writer, and you get distracted a lot like me, this might just be the word processor for you. Or if you’re in college writing a gajillion papers, and you need the portability of a light weight word processor that doesn’t have to plug into a wall, this might be the product for you. Or if you live in an area where the power goes out continually, this might be the product for you. If you’ve been trying to write a 50,000 word novel for three years without success, this is DEFINITELY the product for you. I love my Neo2. There I said it. But I’d still choose Benedict Cumberbatch over my word processor if I had the option. But I doubt he’d make me choose. Those Brits are sensible like that.